One of the most interesting presentations I have seen in the last year is one by Bradley Williams, a utility Research Director at Gartner. Brad has many many years experience in the West Coast electric power industry. In his talk he covered a number of trends and issues facing the utility industry, but the one that really struck home was his analysis of data redundancy in the electric power industry, which many of us have been aware of as a result of analyzing how engineering design data moves through a utility organizations. Brad showed one example (that's Brad's arm in the picture) which involved the lifecycle of a pole from design through build/construction, line extension, test and treat, joint use inspection, storm damage, safety inspection, idling and finally removal. The incredible part of the pole story is that Brad identified nine separate groups within the organization managing very much the same pole data, but usually independently, including Mapping, Connectivity/GIS, Outage Management (OMS), Estimating, Joint Use, Enterprise Asset Management (EAM), and others. This is clearly an efficiency issue, but it's more than that, because when management asks how many poles the company has, potentially there will be nine different answers. Last week I had the opportunity to present a keynote at the Sitewell VIP Conference on Land and Infrastructure Management. Sitewell are the developers of the Czech Ministry of Agriculture's LPIS System that is used to qualify land use and distribute agricultural subsidies to Czech agricultural producers. Mojmir Macek, General Manager of Sitewell, gave a provocative presentation on the evolution of geospatial technology. From Mojmir's perspective the major problem that we are facing is islands of information or stovepipes, where the flow of information always involves making copies, which means redundant data. Redundant data has to be maintained which means redundant processes. One of the most serious problems facing organizations using geospatial data is data quality. The problem is exacerbated by a number of factors including the continuing proliferation of paper, increasing data volume, and inefficient business processes. Mojmir is convinced that this spells the end for "traditional GIS", which creates yet another information stovepipe. It is expensive to integrate with other enterprise applications, requires training staff on another user interface, and exacerbates the problem of redundant data. Mojmir emphasized his point by lighting a candle and holding a mock wake for "traditional GIS." What Mojmir sees happening is that location is becoming ubiquitous, not as stovepipe "traditional GIS" applications, but integrated with existing applications such as search engines, relational database management systems (RDBMS), and CAD/BIM, in other words, what Mojmir calls geospatially intelligent information systems giIS (or what some people prefer to call location intelligent information systems). North American Infrastructure Boom ? 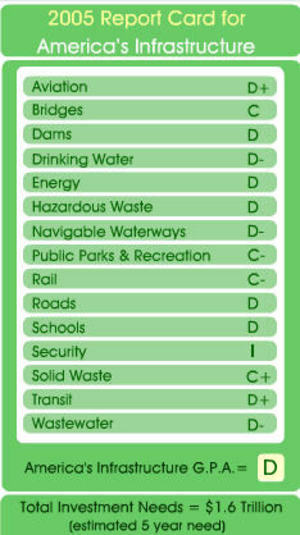 In 2003 and 2005 the American Society of Civil Engineers prepared a report card on the state of US infrastructure. This scorecard has attracted a lot of attention especially the estimate of the US$1.6 trillion investment that the ASCE believes is required to upgrade US infrastructure to an acceptable level . It was the theme of this year's GITA annual conference and I've even seen an ad in the New Yorker referring to it. In this year of a presidential election in the US and talk of the worst economic crisis since the Great Depression, there has been a lot of discussion of economic stimulus packages to revive the economy. Parallels have been drawn to Franklin Delano Roosevelt's New Deal that committed Federal funds to infrastructure and other development to help lift the US economy out of the depression. Politicians seem to be looking at ways to not only improve US infrastructure, but also ways to create employment. Former New York City transportation commissioner “Gridlock Sam” Schwartz is quoted as saying “When infrastructure declines, we’re going to become a second-rate country.” Senate Majority Leader Harry Reid has said it was "the right thing to do" for the infrastructure and the economy. "For every billion dollars we spend in our crumbling infrastructure, 47,000 high-paying jobs are created." The US DOT’s estimate of how many jobs are generated per $1 billion invested in transportation by the federal government was 47,500. But in late March, the US DOT issued a revised estimate that every $1 billion invested into transportation provides 30,076 jobs. Most recently, in mid-April the US DOT modified the figure to 34,799 jobs, and there are caveats about what this number actually means. In June of this year Senator Obama, then the presumptive Democratic candidate for President, made a speech to the US Conference of Mayors annual meeting in Florida where he talked about "rebuilding America’s essential but crumbling infrastructure", that the US needs "to do more, not less," and then he promised to "launch a National Infrastructure Reinvestment Bank that will invest $60 billion over ten years and create nearly two million new jobs." Obama said that Federal money should be invested in a world-class transit system, green energy technology, ports, roads, and high-speed rail. All of this suggests that we may be in for a boom in investment in infrastructure in North America. Autodesk University is coming up the first week In December in Las Vegas. This year there are some really outstanding geospatial related sessions. Here's some highlights. Geospatial Keynote: "Digital Cities—A Model of the Future"
Utilites Keynote: "Design Matters—Utilities of the Future"
Jason Hill on developing FDO solutions. Mike Schlosser on geospatial analysis in an AutoCAD environment.